Enniu: General lack of interest or boredom. That's kind of what I've been feeling about blogging lately. I don't think I'm alone either – several of my favorite bloggers seem to be in the same frame of mind. Perhaps it's all the doom and gloom on the news. Even when you're in good financial shape, you can't help but let it affect your mood. Perhaps it's just not having anything to blog about. Nothing exciting happening here – just routine. Move along to more exciting blogs. Not that there's no news. Hubby and I celebrated our 36th wedding anniversary this past week. Our new blinds arrived that day, so we spent the evening hanging them, only to discover that the headrail was bent in shipping. The company was excellent to deal with and has shipped out a replacement, so no pictures of that yet. The economic crunch also hit close to home. Ben, along with 1600 people in his company, received his layoff notice this week. It's certainly not a disaster. He's never really liked this job anyway and just lacked the initiative to go look for something else. Initiative has now arrived. They've been very financially responsible and are in good shape for the time being, so there's no panic. Of course, we're hoping that something will turn up a little closer to us, but at this point he just needs to find a job. Please send good thoughts and prayers their way. 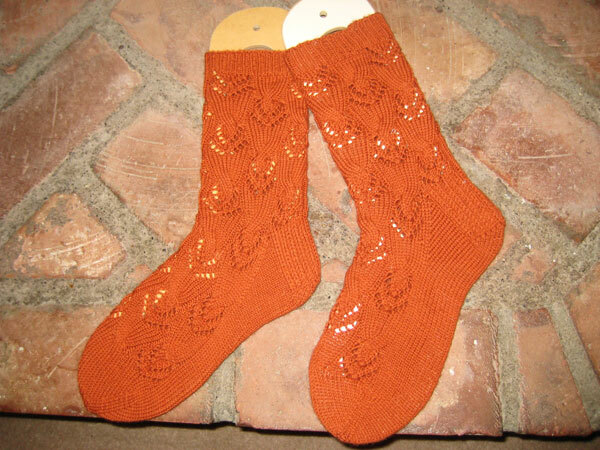 Komet Socks by Stephanie van der Linden for the Sockknitters Anonymous October challenge on Ravelry. 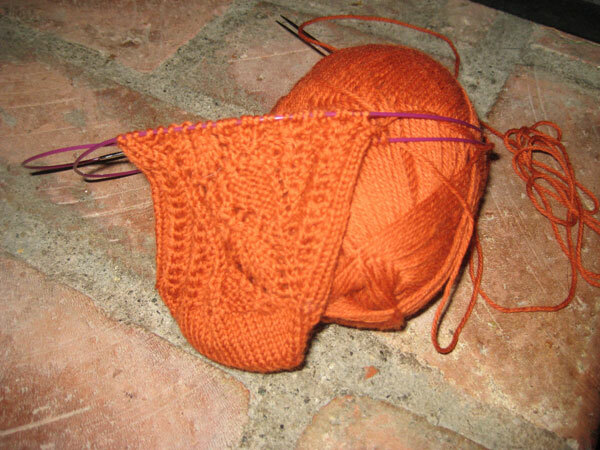 Yarn: Knitpicks Essential in Pumpkin, needles, size 0. Mods – Not technically a mod since the pattern says you can put in your favorite heel. I did a standard flap heel rather than the short row heel in the pattern because it fits me better. This is a wonderful pattern. Easy to memorize, but interesting things going on. I would say I'd do it again, but with the Sockdown challenge, I'm challenging myself to try new patterns and designers. 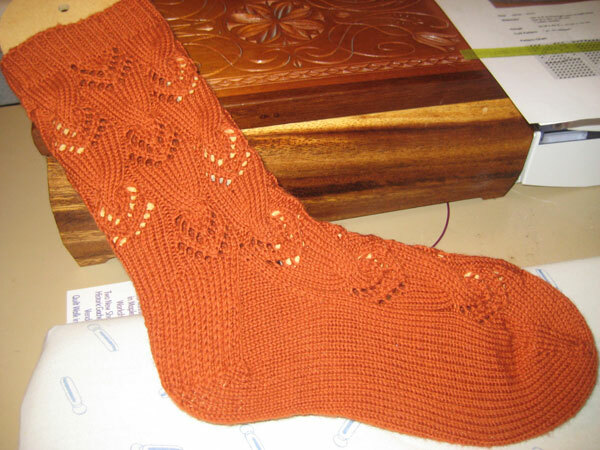 For November Deb is doing a Mystery Sock and I will probably give that a go. In the meantime, I'm committed to cleaning up some old projects that have been languishing. Right now I'm working on the Shetland Garden Faroese Shawl, started back in March. I'm on the last chart and it should be just a week's worth of knitting to get it completed. Today we're going on a cruise with hubby's car club up to Bellingham. I really like going on these cruises, because it's nice to spend time with hubby and I get to knit all day! I'm rather proud of this as it required multi-hooping (those of you who machine embroider will understand that) and I managed to line up everything perfectly. This is the last embroidered block for a quilt that I've been working on. 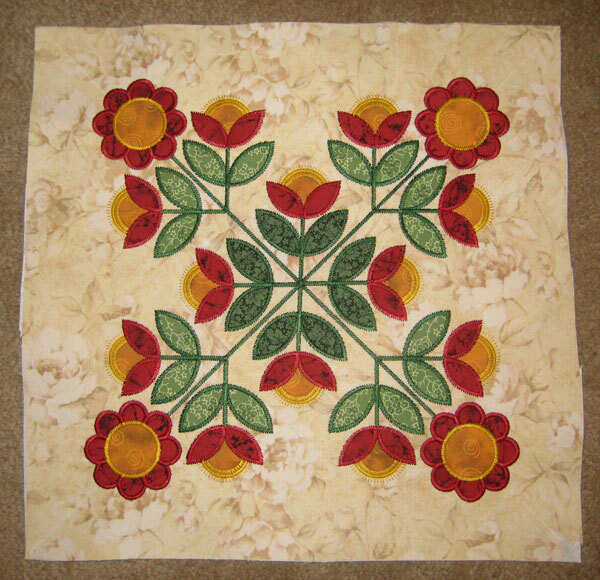 In two weeks I'll be going to a quilt retreat and will be working on putting the quilt together. I wanted to have all the embroidery done so I didn't have to take the embroidery module with me. Next up is to really start practicing on my machine quilting. I've got so many quilt tops stacked up, it would take me more than a lifetime to hand quilt them. And, just in case I don't have enough on my plate, I'm excited about getting into digital scrapbooking. I had started a scrapbook for Izzy, but am only two years behind on hers. I haven't even started Ivy's!! I've been looking at T.J.'s beautiful pages and decided that I am much more interested in digital than all the cutting, pasting and embellishment collecting that the other method requires. I've ordered Photo Shop Elements 7 from Costco. It comes with a scrapbooking tutorial from Linda Sattgast. With any luck, by next week I might have a very simple page to show off. Sweater weather has returned to Western Washington and I couldn't be happier! Summer is my least favorite time of year. I don't like the heat (and here that means anything over 75), and summer fashions don't do a thing for me. Give me the chill of fall and soft comfy sweaters and turtlenecks and I'm a happy camper. Although it's still not cool enough for worsted weight sweaters, I dug out my store-bought ones yesterday. Shorts and tank tops have been consigned to the attic – hooray! Along with fall has come thoughts of Christmas. I spent a great deal of this week knitting on stealth projects for Christmas, so no photos. I have three projects done except for finishing. Of course with my predilection for procrastinating on finishing, this is none too soon. The rest of October is going to be taken up with quilting projects. I'm going on a quilt retreat at the end of the month and I need to get my projects together. I'll try to blog more about that next week. This is a fun pattern and highly recommended. I wasn't sure about the name until I saw the picture – you really can see the comets. I did go down for a tighter gauge. The pattern is for 66 stitches. Even with the cables I was afraid it would still be too large for me, so I went for a gauge slightly tighter than called for. It worked out great and the sock fits well. On to the second! How am I supposed to knit under these conditions?? Do you think she's not getting enough fiber in her diet? I guess I should be thankful those are not originals. 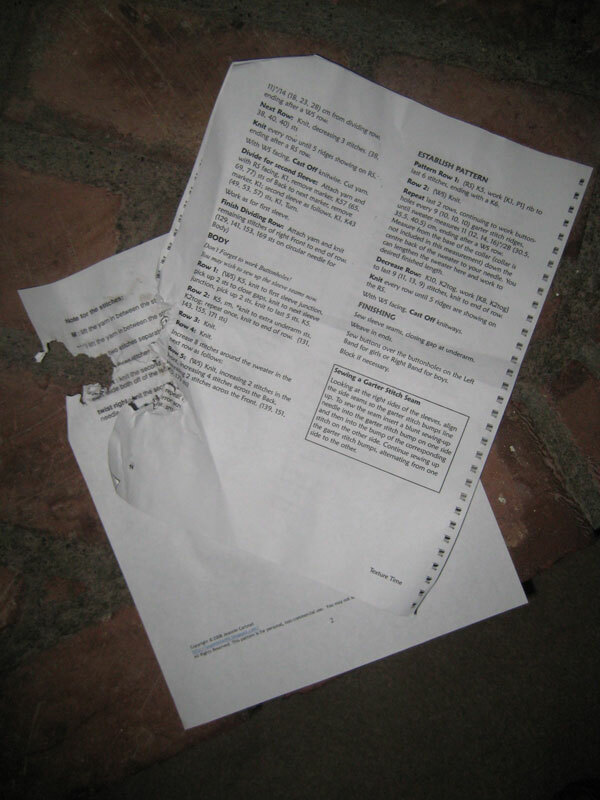 I usually make working copies so I can mark them up and offer them to the dog for an afternoon snack. I usually don't get too political on this blog and I'm not going to start soon, but I am so frustrated by this economic bail out mess that I could spit nails! I grudgingly see the need for it (I think), but I'm seriously annoyed by the irresponsibility that led up to it. Whatever happened to personal responsibility? Our grandparents who scrimped and saved during the Great Depression are probably spinning in their graves. Whatever happened to living within our means? We have become a nation of greedy consumers who believe that we deserve to have everything we want, even if it means paying for it with money we don't have! I was appalled to hear of the number of companies (including, apparently, the state of California) that rely on credit to make payroll. One of my favorite websites is Debt Proof Living. Mary Hunt recommends a 10-10-80 style of living. You give away 10% of your income to whatever charity fuels your passion. This makes you thankful for what you have, especially when you focus on those who have less. You save 10% of your income. This prepares you for emergencies that WILL come! Then you live on 80%. This curbs your greed because you realize that you have a finite amount of money coming in every month and there are just some things you can't afford. You make do with what you have. For under $50 I have enough for 6 pairs of socks. Other than the orange, I decided to stick with muted colors to match my work clothes. I like the tweed and kettle dyed colors of the Essential yarn. And the price is certainly right. 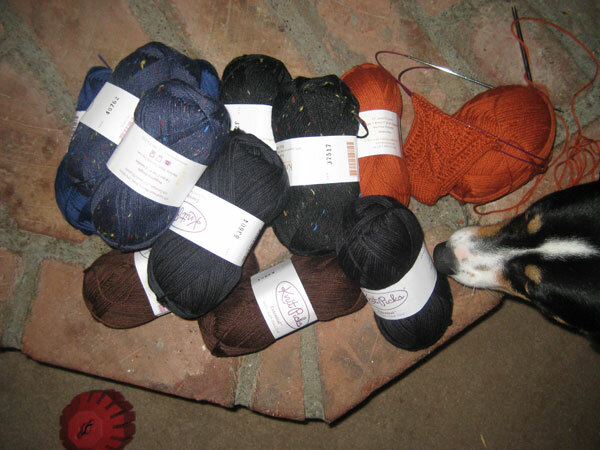 And yes, the yarn is in danger – Maggie likes to steal yarn as well as patterns. We did go out and spend some money this week. A new storm door for the front door for winter, a new doggie door (the old one had lost one of the baffles and cold air was pouring in) and thrill of thrills – new wooden blinds for our front window!!! 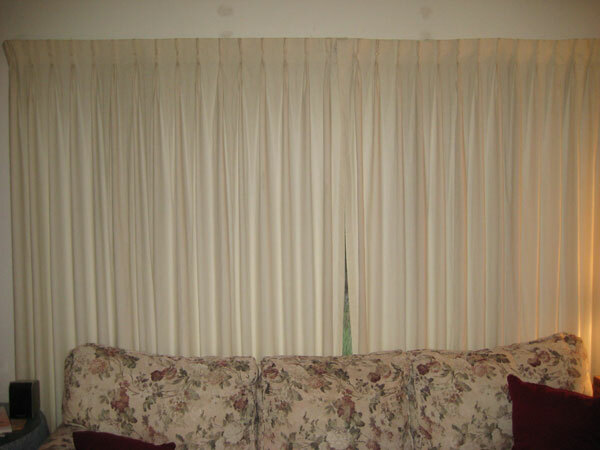 Speaking of making do, we've had the same drapes for 23 years, so I think we've paid our dues on those. I've come to despise them, but we just never had the money and the decisiveness at the same time. Finally the planets aligned and we were able to agree. They should arrive in a week and I'll post a picture. And we have the cash for all of the above, so no debt!